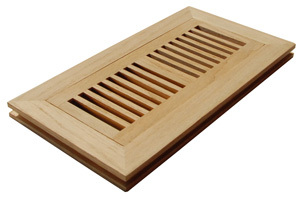 The floor grates are also called floor registers, a flush mount floor grate sits flush with 3/4” hardwood floor. It is designed to lay flat with the surface of the wood flooring, provides two way diffusion and is the preferred style for sand and finish hardwood floors where an architecturally smooth look is desired. Each frame is grooved on the outside to accommodate most 3/4” tongue and groove flooring. It is recommended that this floor grate be installed during the installation of your hardwood floor, while the use in traffic area is not recommended.